Plavsko Jezero is a lake in Plav municipality, in northeastern Montenegro. It is a glacial lake located between the Prokletije and Visitor mountain ranges at an altitude of 906 meter above sea level, and extends north-south for some 2,160 meter. Its average width is 920 meter, and its maximum depth is nine meters. 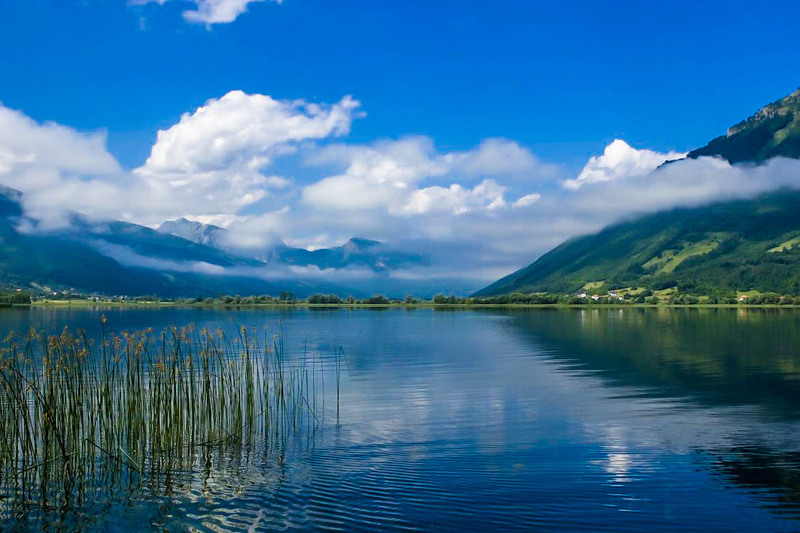 It is the largest and most beautiful lake in Plav, and is also the best known tourist attraction in the area. The area around the lake is ideal for trekking, hiking and mountain-biking and the lake itself is only one of a large number of mountain lakes that can be visited, whether it is for a quick swim or a relaxing picnic. The whole Plav region nestles at the foot of the towering Prokletije mountain range and rests on the banks of Plavsko Jezero. The geology of Plavsko Jezero and the surrounding lakes, streams and rock formations is very interesting. The lake itself is full of limestone caverns and there are many springs where water gushes forth from the earth.